"Beautiful to look at, great blend of flavors and colors, plus it is super simple to make! Terrific as a side with Mexican cuisine!" 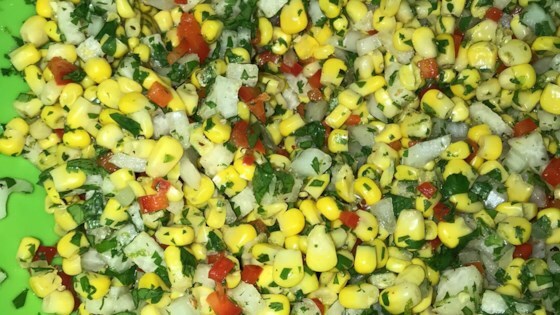 In a large serving bowl, combine the corn kernels, jicama, mango, red onion and cilantro. Pour the lime juice over, and season with salt and pepper. Toss until well blended. This was a really good salad. I think a little jalapeno would be and excellent addition. It was crunchy, and very tasty. I will definately make this one again. This recipe made enough for probably 12, not 8! It came out so-so; was much better the next day topped with Dungeness crabmeat moistened with wasabi mayonaise. Wonderful. I added sweet red pepper and black beans - for color. I'm not a fan of mango, so I removed it and added a fresh jalapeno diced up! It turned out so yummy! It was the first time I had jicama this way and my boyfriend loved it, too!